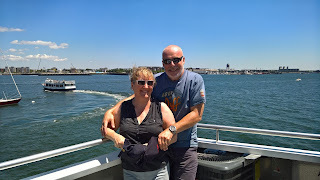 We are coming to the the end of our week in Boston and today we had no real idea what we would do - we agreed that we might try the Aquarium in Boston Harbour, but soon changed our mind over breakfast when we compared watching fish in a tank to seeing whales in the wild. I have never seen a whale up close before in the wild - I do recall see in killer whales in Sea World in Florida on holiday many years ago. We were warned when getting our tickets ($49 each) that it would take at least three hours round trip. We set off at 12 noon and enjoyed the fast ride out to the Stellwagen Bank Reserve, and it wasn't long before we spotted some Humpback whales - there were seven together in a pod, including several baby calves. Lots of oohs and aahs from the small crowd on the boat. We had a great view of everything. We saw the whales forming bubble pools to force fish to the surface, and of course the majestic creatures when they broke the surface. The boat got right up to the pod - we had a perfect view. I shot mostly video (which I cannot upload from my iPad), which I will have to wait until I get home to post. This is a problem for me using a Windows phone and an iPad together. This was worth every cent of the $49 ticket. We were lucky we had a beautiful day with almost calm sea conditions - don't miss this if you ever come to Boston.